Simmer the sliced squash in a pot of salted water until tender. Drain well. Heat the oil in a skillet over medium high heat. Add the onion and the squash and stir. Cover the skillet and turn the heat down to low. 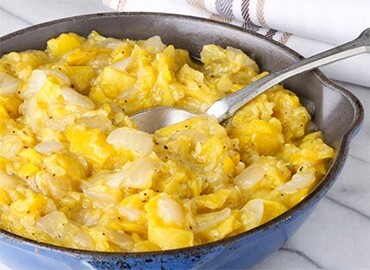 Cook slowly for 20-30 minutes, stirring occasionally, until squash is very soft. Remove cover and continue cooking until any extra liquid has evaporated. Season with salt and pepper to taste.